Two mice, one white and one black, little by little started to gnaw away the vine. The man saw a luscious strawberry near him. Grasping the vine with one hand, he plucked the strawberry with the other. I've spent a lot of time lost in thought. I remember asking Margaret, a girlfriend while I was in graduate school, to remind me to "BE NOW" whenever she noticed that I had trailed off to some other dimension -- then usually a science realm of some sort. I was very proud of my mental ability. The fact that I tended to be in some "mental" place at anytime of day or night indicated to me that I had become an intellectual. It's interesting to me now that I identified "lost in thought" as a sign of intelligence. Perhaps that was the example shown to me by so many of the professors and scientists that I admired so much -- particularly, the more eccentric ones. It now seems that I was simply lost -- not being present -- not fully Being. It turns out that it's not just those who self-identify as intellectual that spend most of their time lost in thoughts. The mind is constantly talking, like an insane person one sees sometimes on the city street. It's the egoic mind -- striving to be in control and justify its existence. It fears the collapse of the ego and creates the illusion that it is in control of the situation -- that it is, in fact, the Self. On retreat, it typically takes 3 or 4 days of continuous, silent meditation for the mind to reach a level of relative stillness -- so close, yet so far away in our daily lives. Within such stillness, the world seems very alive and easy to understand and appreciate. I finally got around to reading Eckhart Tolle's book, "The Power of Now." A lot of people like the book, so I was prepared to be unimpressed. I thought that the Now is obvious -- a fundamental part of meditation, as I had experienced it. Tolle shows that the concept is both simple and profound. "Resistance to the Now as a collective dysfunction is intrinsically connected to loss of awareness of Being and forms the basis of our dehumanized industrial civilization," writes Tolle. "This collective dysfunction has created a very unhappy and extraordinarily violent civilization that has become a threat not only to itself but also to all life on the planet." "The voice in the head has a life of its own. Most people are at the mercy of that voice; they are possessed by thought, by the mind. And since the mind is conditioned by the past, you are then forced to reenact the past again and again. The Eastern term for this is karma." Most of us have our sense of self rooted in the past and place a high value on creating a future. But, the past is only a story and the future is, at best, uncertain. 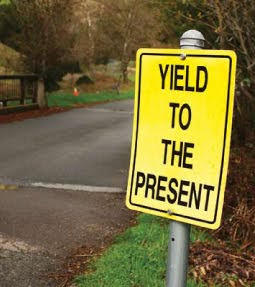 The present is something we tend to endure as we attempt to reinforce our sense of self-identity from the past while grasping at a safe and secure future. Life passes by in such illusions that mask our lives from Truth. Living solidly in the present pierces the mind's control on us and allows us to see what is real. It is the timeless reality beyond form. The egoic mind is very clever and insecure. It makes judgments against Truth in order to justify its own "self". It tells you how important you are and how separate you must maintain yourself from the "other". It will tell you that it knows something to block you from investigating it carefully. It will judge that which does not support it as unworthy. Living in the present contradicts our conditioning. Notice how difficult it is to be fully present, how difficult it is to wrestle control away from the mind, how difficult it is to not have a story -- see crystal clear reality. Then, notice it without judgment -- upon yourself or others. Don't merely imagine yourself doing this -- take the time to investigate and experience it. Listen to the silence, the void of nothingness, the unmanifested. Surrender to what is rather than allow the mind to judge, criticize, delay and resist reality. Dissipate the ego and become free of its grip. In the space between past and future lies the silence of the timeless present. Everything that one needs exists in the present moment and the present is all there is.